I woke up to a voice message from Steve on Broadway alerting me to "news" from Michael Riedel of the New York Post. In FROM ANGELA TO ZETA - ZETA-JONES IN 'NIGHT MUSIC,' SO LANSBURY STAYS IN CAST, Michael says that Catherine Zeta-Jones will play Desiree and Angela Lansbury will play her mother, Madame Armfeldt, in the upcoming revival of A Little Night Music. Now, I'm not one to look a gift horse in the mouth: ANGELA! YES! I TOLD YOU SO! But, Catherine? Ugh. Damn it, we have so many beautiful and fabulous out-of-work BROADWAY stars perfect for Desiree and producers had to go to Hollywood to get practically a b movie actress whose main credits are a cell phone commercial and being married to a huge giant legendary star? Please. Okay, okay. Catherine won an Oscar for her Velma Kelly in the film of Chicago. I admit that I've warmed to that performance - come on, it's hard not to - it's Chicago, it's Kander & Ebb. But, that ain't eight times a week on Broadway, baby. Sigh. Still, It's ANGELA LANSBURY. It's A LITTLE NIGHT MUSIC. I'll be there. This revival is set to begin at the Walter Kerr (hello, I can see this theatre from my office) this December. Gah! I'm throwing up right now. Huh - I've posted my comment twice, but blogger keeps rejecting it. I'm right with you on the frustration, SarahB. There are many skilled theatre actresses who would do Desiree proud. And, also, I hope to GOD that Sondheim demands a decently sized orchestra. Tunick's orchestrations demand proper representation. Also: Zeta Jones has stage experience from her days as a West End chorus girl. She was a Peggy Sawyer and toured in the Pajama Game, among other stuff. She also can sing -- so it'll be nice to have a Desiree on a legitimate ALNM recording that can actually sing Sondheim's score. Donna Murphy woulda been better for me. Or Toni Collette -- as I was rooting for. Donna Murphy! Victoria Clark! Bernadette Peters! Christine Ebersole! Barbara Walsh! My first reaction was to gag but then when i thought about it, and didn't she start out in theatre?, it doesnt seem so bad does it? V. Clark isn't really glamorous in my eyes. Too pedestrian. Murphy would act the hell out of it. Ebersole - hated her singing voice in that ALNM concert audio -- the score sits too low for her. However, her Clowns was DIVINE. She radiates starpower, too. Considering Catherine hasn't really lit up the screen since winning the Oscar in "Chicago" I'm sorta surprised that she's the big name they would go for. Also, she turned down "Nine" because Rob Marshall refused her demands to expand Claudia ("Unusual Way") Nardi into a larger part. Nicole Kidman took over. I only wish Angela's demands had included the full original orchestration. I'm bummed. I've actually been down about the whole project since the passing of Natasha Richardson. She was beyond brillant that night! Besides that, I have my doubts about Catherine. Film and Stage are two very different things and while she mastered Chicago on film and came from a theater background, it just doesn't sit right for me. Eh, I'll be there sometime during previews anyways! The two names that kept popping up in my head were Donna Murphy and Christine Ebersole. Murphy perhaps woulda been my top choice. Ebersole seems right, but I actually have grown annoyed with her. Of course, anyone can always say Audra in order to get me to melt. Well, as I mentioned in my email, the media flow states that Angela specifically requested a Hollywood star for that role. Surprised the h out of me, but that's the commentary. Maybe you can check that out with her Sarah. HI Jiva - actually the original article by Riedel doesn't mention "Hollywood star" just "another star" - and he's the person who initially broke this story: "The great Angela Lansbury had agreed to play Madame Armfeldt, provided the producers lined up another star to play her daughter, Desiree." Yes, I stand corrected. I looked at it again and it only says "big star." "Sondheim called Zeta-Jones and persuaded her to do "Night Music" instead. It will open at the Walter Kerr in mid-December." He must have faith in her abilities. It will be interesting, that's for sure. I saw the production Friday night, and it was truly magnificent, including the performance by Zeta Jones, whose glamour is undeniable, and who acts and sings the hell out of the role. Her "Send in the Clowns" brought my fiance to tears. 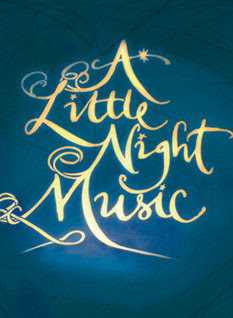 An elegant and moving production of a magical piece of musical theater!